I really love designsponge...on certain days I feel like she is reading my mind.I am sponsoring a chair-e-ty at my school. Our school decided to replace the old 50's metal and wooden chairs with these horrible plastic and metal chairs. I know the later will not last as long as the original chairs endured. I've invited alumni students of Parkville High School as well as alumni faculty along with other artist/teachers. I'm excited about this event. Anyway, after a day teaching and organazing and chairs on my brain...design sponge shares a site on this amazing sculptor Doris Salcedo. ms. salcedo is a colombian sculptor who often uses furniture in her work. 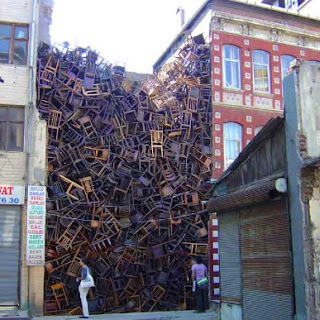 the installation above was created for the international istanbul biennale in 2003 and included over 1550 chairs stacked between two city buildings.